This year over 1500 Chicago Public School students from 59 high schools and 14 middle schools from across the City of Chicago will compete in academic debates. The students’ contests are characterized by evidence-based argumentation, detailed policy analysis and direct refutation of their opponents’ policy positions. Debaters spend an average of 440 hours of out-of-school time researching and reading source materials to gather evidence. Their topics are complex and include issues such as transportation infrastructure, military policy and poverty. Emmitt Bowles, a former high school debate and current insurance and retirement company owner at Bowles and Bowles Insurance, serves as a volunteer judge and coach for the Chicago Debate League (CDL). Emmitt says that he utilizes the skills he learned while debating in his personal and professional every day and he feels that his experience as a volunteer helps him to provide opportunities to students that would otherwise have been unavailable. “Our students have big dreams. Nothing gives me more joy than hearing a student vocalize their dreams and aspirations. To play a small role in helping these students realize the potential and greatness that they have within themselves is both a humbling and good learning experience” said Emmitt. Clinton McClure, who currently volunteers as a judge CDL judge, promotes that the opportunity gives him a chance to help debaters hone their craft just as debate helped him in high school. “Whether I work by day designing improvements for transportation systems as a civil engineer, or critique speeches as a judge, I value the opportunity to help make connections so that people can move to new and better places,” Clinton said. 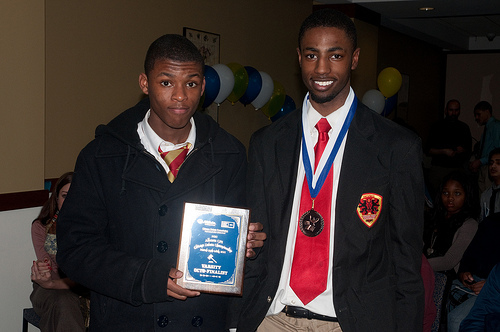 The Chicago Debate Commission (CDC) is the non-profit private partner to Chicago Public Schools in the administration of the Chicago Debate League. The CDC has been helping transform the lives of public school students in Chicago since 1995. To become a volunteer judge or coach visit The Chicago Debate Commission profile on One Good Deed Chicago’s website http://bit.ly/xp7g98. Two years ago Orion Casey was making minimum wage as a teacher’s assistant at a childcare facility. Today she works as an IT professional at M. Block and Sons, a corporation that offers her a full time salaried position with benefits. As a young mother of two, this shift has been life-changing, and it began when she joined a program called Year Up. Year Up is a free, intensive, one-year program focused on preparing urban young adults for corporate careers in Information Technology. The first six months of the program are spent taking courses that focus on technical and professional skill building. Through these courses, students have the ability to earn up to 18 college credits from Harold Washington College. The second six months of the program are spent applying the learned skills at corporate internships, such as Google, J. P. Morgan Chase, and Bank of America. Students in the program are also offered a wealth of supports including professional mentors, advisors, social service support and even a stipend of up to $900.00 per month. While Year Up is still new on the Chicago landscape (opening its doors to students in September of 2010), the organization has built a strong representation nationally, as it currently serves 8 major cities across the country. This growth has been enabled by fantastic outcomes in each of its sites. An example of those outcomes is that within four months of graduating from Year Up, 84% of its graduates continue onto full time education or careers with an average starting salary of $30,000 annually. 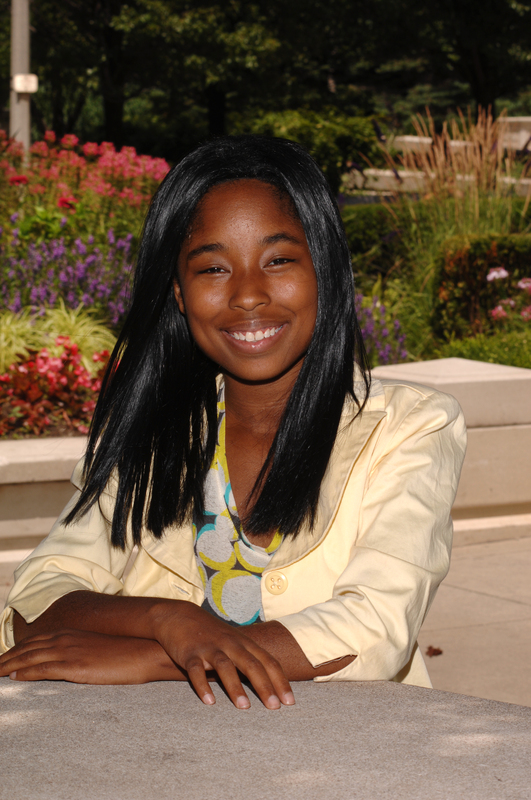 Orion, who was offered her position on her graduation day, is one of the many examples of students from the Year Up Chicago site whose lives have changed with their decision to apply to Year Up. “I received way more than just training for a job,” Orion said, reflecting on her experience in the program. “Year Up really worked on everything from work ethics to social skills. By the time you’re finished they’ll definitely have you well equipped for your journey to success”. Year Up serves 18-24 year olds with a high school diploma or a GED certificate and is accepting applications now for its next group of students. There are also many opportunities for volunteers to get involved. For more information about Year Up, or to download a student application, visit www.yearup.org or call (312) 726-5300. Youth paint during an activity with Lawrence Hall Youth Services. Lawrence Hall Youth Services is one of Illinois’ oldest child welfare agencies, established in 1865 to assist at-risk youth and their families with services that develop the self-worth, knowledge, and skills they need to lead independent and productive lives. One Good Deed Chicago connected Lawrence Hall with the Executive Service Corps (ESC) of Chicago in September 2011 as part of the One Good Deed VolunTEAM project. Their objective: By the end of May 2012, to evaluate and structure the organization’s volunteer management to meet diverse needs while ensuring a positive and fulfilling experience for more than 200 volunteers. The ESC consultant assigned to the project, Thomas White, has more than 20 years of corporate leadership and project management experience. He works closely with Nathan Rosato, Lawrence Hall’s Director of Community Relations. Together, they began with a systematic study of current volunteer utilization patterns and needs assessment from a cross-section of program areas to identify required functions, estimated volunteer hours, responsibilities and needed skills. Armed with this data, White and Rosato began building a matrixed volunteer management program that that views volunteers through multiple lenses, all interconnected and each with different benefits. To ensure the most capable and committed volunteers and balance the needs and objectives of both the volunteers and Lawrence Hall, the team is reviewing volunteer position descriptions and considering a more comprehensive use of existing volunteer management software to ensure the best match between talent and function and accurate tracking of hours for improved planning. They are updating a handbook that will help to standardize volunteer management policies and procedures throughout the organization and establish a targeted recruitment plan to ensure an ongoing source of the varied skills and talents needed throughout the year. Volunteer Wesley Tibbs describes his role as a member of Lawrence Hall’s Junior Board. Kim Luckey, Lawrence Hall’s Director of External Affairs, calls the project with ESC and One Good Deed Chicago an opportunity to re-evaluate their needs and review what’s working well and where extra help is needed. “Our volunteers are important to us; we not only benefit from their contributions of time and talent, they are our strong connection to the community,” she says. As nonprofits struggle in an environment of unusually deep and lingering economic stress, facing diminished resources even as the demand for service increases, the need for a an effective volunteer program, streamlined, efficient operation, strong leadership teams and diverse sources of revenue become mission-critical. As a nonprofit with a proud reputation for service and results, ESC is the premiere consulting resource for nonprofits in these areas, ready to help with practical and affordable solutions for lasting impact. To learn more about Lawrence Hall Youth services and its positive impact on youth and families, please visit www.lawrencehall.org. To learn more about the Executive Service Corps of Chicago and its services in leadership development and coaching, strategic planning, fund development, urgent action, executive transition and interim executive director placement, visit www.esc-chicago.org or email Jo.Posselt[at]esc-chicago.org. Rachel Taylor of Simply Social Chicago teaches a group of more than 20 nonprofit professionals during "Social Media 201: Sharpening My Skills" at Microsoft's Chicago office. Nonprofit professionals learned tips and tricks for using social media to expand their missions April 9 at the Social Media for Nonprofits workshops presented by One Good Deed Chicago, Eventbrite Chicago, Chicago Cares and Simply Social Chicago. Melody Burton of Chicago Cares led the first workshop, “Social Media 101: Just Getting Started.” She shared an overview of the major platforms, strategy and etiquette. 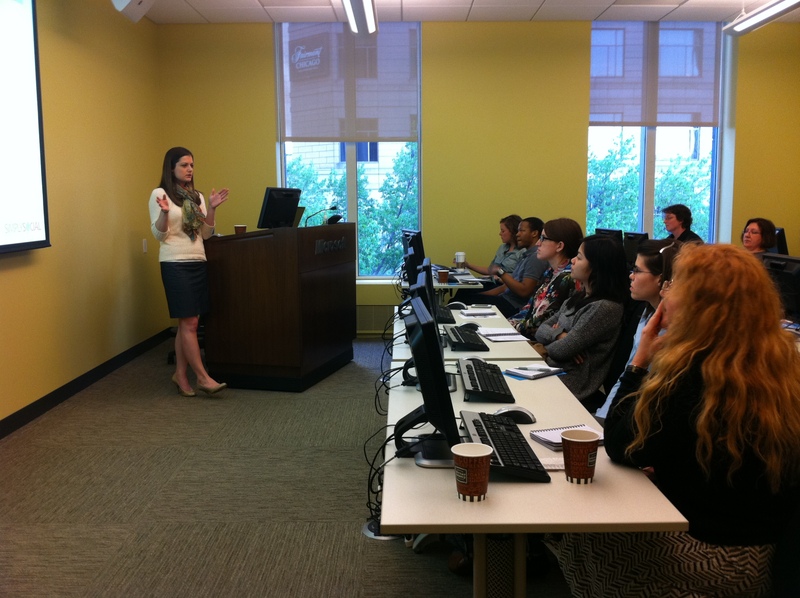 Sara Altier of Eventbrite Chicago discussed using Eventbrite’s social tools and LinkedIn. Rachel Taylor of Simply Social Chicago led the more advanced workshop, “Social Media 201: Sharpening My Skills.” Rachel delved into topics like creating a content calendar, using Facebook ads and more. Thanks to all of our partners who made these workshops a huge success! I hope the information can help Chicago’s nonprofits gain awareness and more volunteers. We’ll be presenting two more workshops for nonprofits this spring: one on done-in-a-day service projects, and another on using skills-based volunteers. Click the links to register– they’re free! “A mother must be physically strong, emotionally stronger, and spiritually strongest.” This is the message that Pascale Burns, mother of four and Midtown Educational Foundation advocate, shared with more than 200 mothers on Saturday, Feb. 18. The day marked Metro’s 12th annual Mother-Daughter Day Luncheon, where people from Chicago’s underserved communities gathered together to honor each other with the Valentine’s Day –themed lunch, “Mothers are Stronger Role Models than Pop Culture.” I was lucky enough to spend the day at this event. As One Good Deed Chicago’s Service Initiatives Coordinator, I often get the chance to attend the events of our Success Coaches partners and see their work firsthand. 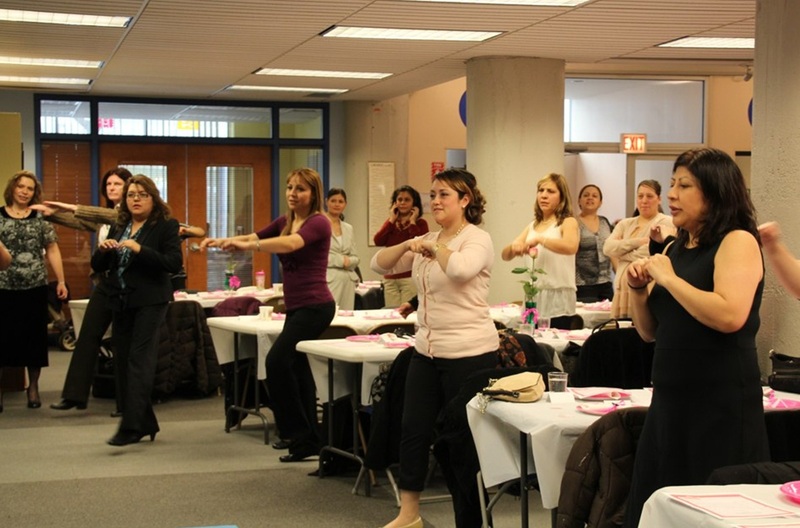 Mothers at the event do a Zumba-style dance exercise. The event began with a call to action. Local priest, Father John Waiss, reminded not just daughters to honor their mothers, but mothers to also honor their daughters. “Mothers, honor your daughters by picturing what qualities you want your daughter to possess and then acquire them yourselves,” he said. 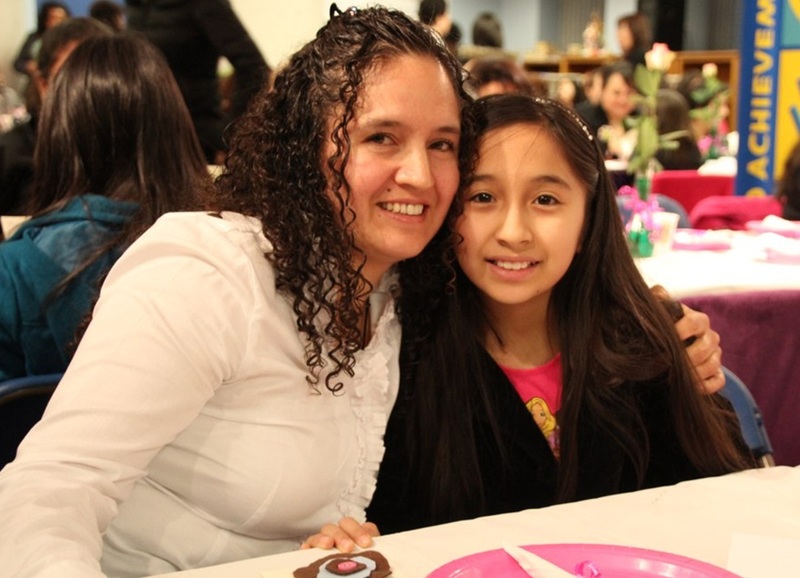 Mothers and daughters separated for part of the day; Daughters wrote love letters to their moms, while the parents had a chance to discuss what makes a strong and successful mom. The event reminded me of the important relationship that I share with my own mother and the significant role that she played in my development as a self-confident and independent woman. I am thankful for the work that Metro is doing to build and support similar relationships between the mothers and daughters in Chicago. In addition to hosting an inspiring event like this, Metro for girls, along with its brother site Midtown Center for Boys, is celebrating 12 consecutive years of 100 percent graduation and college enrollment. Midtown Educational Foundation helps close the achievement gap for Chicago’s urban youth by providing one-on-one tutoring, high school prep, and college counseling. If you are interested in contributing to Midtown and Metro’s success, become a tutor! Visit the profile of Midtown Educational Foundation, the sponsoring nonprofit organization for Midtown and Metro, on OneGoodDeedChicago.org to learn how. 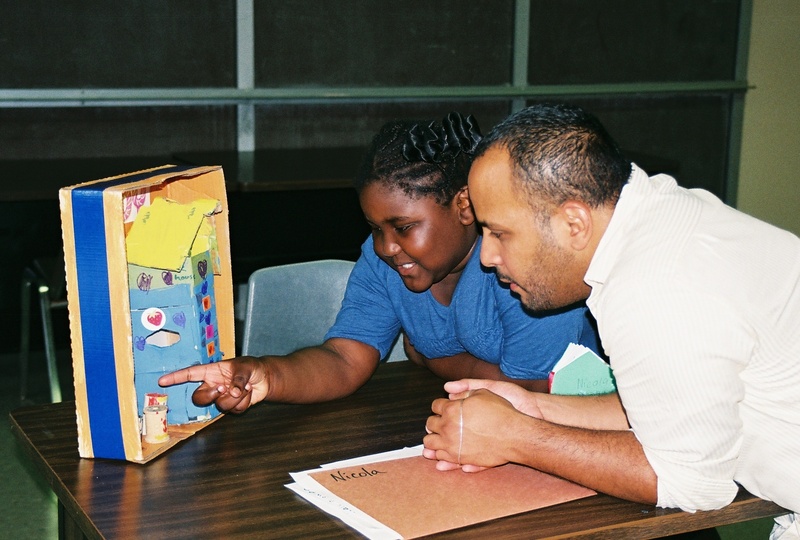 A student works with a volunteer at Changing Worlds. 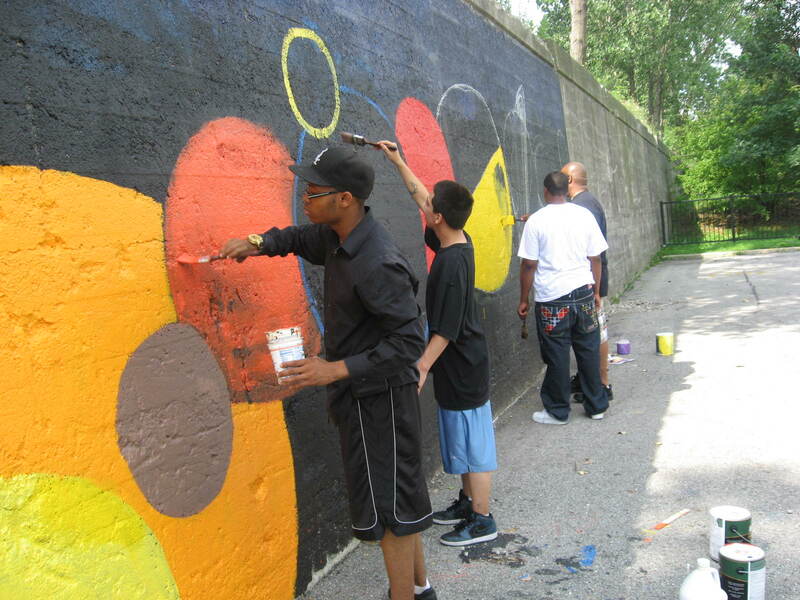 Changing Worlds is one of One Good Deed Chicago's VolunTEAM partners. One Good Deed Chicago connected Changing Worlds with the Executive Service Corps (ESC) of Chicago in September 2011 as part of the VolunTEAM program. ESC is a volunteer corps of nearly 300 men and women who use their skills and knowledge from long and successful careers to help other non-profits thrive. The project is scheduled for completion in May, but the results to date are already a noticeable and satisfying success story on many levels for everyone involved, including the volunteers, the program staff and of course the children who benefit from these programs. Changing Worlds Executive Director Mark Rodriguez points out that it was critical to the project’s success to create a clear direction at the beginning. “We needed to be able to create an infrastructure for our volunteer program as well as a system and a process that would be sustainable when the project is over,” he said. The ESC project management team, David Marienthal and Estelle Holzer, worked with Patti and Mark to evaluate specific needs. They then began identifying lasting solutions and immediate changes that could be readily implemented without additional workload burden or cost. Both David and Estelle brought more than 20 years of experience in project and program management to the assignment and were able to make recommendations that produced immediate results. As the economy struggles, as money from state and local governments dries up, and as donations and foundation monies shrink, non-profits are facing the perfect storm. Demand for their services is increasing dramatically, just as revenue sources are dwindling. The need for non-profits to improve their organizational performance is as important as it ever was. It’s ESC’s mission to help them. To learn more about the Executive Service Corps of Chicago or apply to be an consultant, visit the ESC Website at www.esc-chicago.org. For a list of all 19 nonprofits currently in the One Good Deed Chicago’s VolunTEAM program, go to www.onegooddeedchicago.org/priorities.